Today, Victoria’s once-prosperous goldfields bear riches of a very different nature. Expect splendid Georgian and Victorian architecture, history by the bucketful, and some of the state’s most sought-after gourmet goodies and boutique wines, all in the heart of Victoria’s rugged bushland. An hour and a half’s drive from Melbourne, the streets of Ballarat epitomise gold rush–era affluence, and still possesses all the grace and grandeur of this iconic period of Australian history. Stately Victorian-era buildings hark back to its goldmining heyday, while swish eateries tucked inside serve up inventive international cuisine and some of the finest paddock-to-plate fare that the goldfields has to offer. This foodie influence has mushroomed – no pun intended – over the last decade, earning Ballarat an honorary spot in Melbourne’s Food and Wine Festival. Ballarat is famed for pairing its proud gold rush heritage with a healthy dose of the daring and new in the form of chic art galleries and microbreweries, which are among its many drawcards. As one of the larger towns in the goldfields region and the site of the Eureka Rebellion, Ballarat teems with tales of its gold rush glory days. The town’s greatest attraction is the replica goldmining town of Sovereign Hill, where staff don period garb in an immersive, educational experience for history buffs both young and old. The living, breathing museum spans 25 acres, and invites visitors to try their luck panning for gold, explore old-timey lolly and craft shops, or venture underground to trace the footsteps of the miners who helped Ballarat to flourish on the world stage in the mid 1800s. In 1851, gold was found on a sheep farm near Castlemaine – the site that would become Mount Alexander Diggings. The discovery galvanised the Victorian gold rush into motion, and soon, the goldfields had attracted thousands of optimistic prospectors from every far-flung nook of Australia, and even the world. 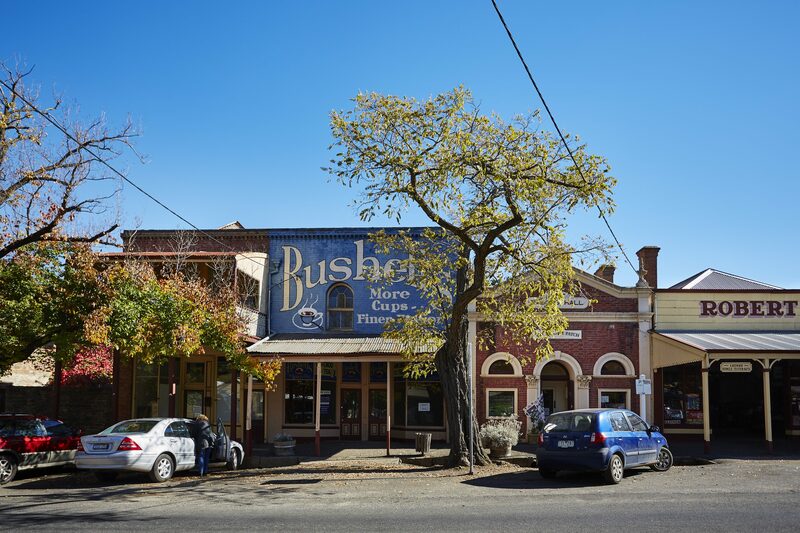 Castlemaine was built quickly to cater for the influx of optimistic diggers and their families, and lavishly, to reflect its gold-town status. For a fleeting period, Castlemaine’s population even outnumbered Melbourne’s, whose residents descended on the alluvial soils in hope of unearthing a fortune. Enterprising folk leapt on the opportunity to start businesses, and this entrepreneurial spirit persists today through Castlemaine’s bourgeoning food and wine scene. The little town boasts a stellar foodie line-up, including exquisite pastry shops, artisanal ice-cream stalls, fruit farms, gastropubs, wine bars, and local markets, among surprising and yummy inputs from Viennese and Asian cuisine. Locals are deeply engaged with Castlemaine’s gourmet culture, which esteems seasonality and high-quality, local produce above all else. Today, Melburnians still turn to elegant, friendly Castlemaine for refuge from big city chaos. Less than a 20-minute drive west of Castlemaine, time appears to have been suspended in the leafy hamlet of Maldon. A bastion of Victorian values, Maldon transports visitors to a simpler era where fresh, local produce is the only food to be eaten, and where good taste is a hallmark of good character. Where its older neighbour, Castlemaine, is famed for Georgian architecture, Maldon favours the fashionable Victorian styles carried over from England some years later. The National Trust considers Maldon one of Australia’s most intact heritage streetscapes, thanks to its weatherboard cottages, wide verandahs, stone buildings, cheery Victorian shopfronts and European gardens. Underneath the town’s vintage veneer, however, bustling local businesses tell a newer story. Old stores have been converted into cafés serving up creative, modern dishes, and workshops have transformed into art spaces and galleries.